The Mocorunning.com Girls All-Freshman Team is composed of a Freshman of the Year and the next ten talented young athletes with potential to be future stars. Results from indoor and outdoor track were used to assess the freshmen for this team (cross country season has its own All-Freshman Team). Additional bright young athletes are included as honorable mention. Bethany White, Magruder - Bethany White took the state by storm during the indoor season when she placed 4th, 3rd, and 3rd in the 55m at counties, regionals, and states. She had a season best time of 7.19 which is the fourth fastest by a Montgomery County girl of any grade in the last five years. Her best meet outdoors came at the county championship where she finished fifth in the 100m in 12.27 and helped break the county meet record in the 4x100 relay. She also placed third in the 100 at the state championship and clocked times of 26.38 and 42.23 in the 200m and 300m. Alexia Mitchell, Gaithersburg - Alexia Mitchell had the second fastest county freshman sprint times after Bethany White from the 55-meter to the 300-meter. Her season best times were 7.60, 12.60, 26.45, and 44.50. She is one of several Maryland Titans on this list, and she won the AAU 4x100 national title last summer on a team that also included Kendra Meredith. Angel Graham, Clarksburg - This year's girls rewrote Mocorunning's freshman leaderboards in the throwing events and it started with Angel Graham. At the Knights Invitational, she recorded a mark of 35-03.50 in the shot put which is over a foot farther than any county freshman in the last five years. She also threw 83-06 in the discus but could not finish the season due to a tear in her ACL and meniscus. Claudia Ababio, Clarksburg - While Angel Graham holds the top shot put mark by a county freshman outdoors, Ababio was actually first on the scene becoming the first MoCo freshman to throw 30 feet indoors in the last five years. Outdoors she finished fourth at the county championship with a season best mark of 34-00.50. She also threw 91 feet in the discus becoming the first girl in Clarksburg history to throw 32 and 90. Emma Teal, Walter Johnson - Emma Teal brings the international flavor to the all-freshman team. She is Australian and participated in track and field in Indonesia before coming to the US. She qualified for the state championship in the high jump both indoors and outdoors. She placed ninth at the state championship with a jump of 5 feet, and also cleared 5-02 in a dual meet. Grace McDonald, Sherwood - Grace McDonald emerged as the top county freshman miler this year. She finished fifth at the outdoor county championship with a season best time of 5:24.58. She ran 2:27.6 in the open 800 and split 60 seconds on Sherwood's 4x400. Coach Dan Reeks says that she is very coachable and has two younger siblings. Jamillah Jonjo, Quince Orchard - Jamillah Jonjo improved rapidly towards the end of the season. At the outdoor regional meet, she threw personal bests in the shot put (31-07.25) and discus (98-02). She finished fourth to qualify for states in the discus and improved her best to 103 feet, the best by a county freshman in the last five years by over ten feet. According to Coach Seann Pelkey, she accomplished these things with no spin in her throw. Kendra Meredith, Northwest - Kendra Meredith is the first athlete to receive Mocorunning all-freshman honors for accomplishments in cross country and the long jump. This versatile athlete who also plays basketball was the long jump runner-up at the outdoor county championship with a mark of 17-00.50. It was the third best by a county freshman in the last five years. She also helped Northwest win the 4A 4x100 state title in a school record time of 47.52. Naomi Sheppard, Northwest - Naomi Sheppard surprised some folks with a third place 800m finish at the indoor county championship meet. She proved to be legit as she dropped her time down to 2:21.89 outdoors to qualify for the state championship. She also ran 5:29.71 in the 1600 and helped Northwest sweep county, region, and state titles in the 4x800 relay. 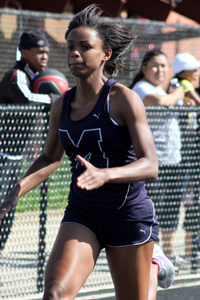 Shaneil Thomas - Northwood - Shaneil Thomas led all Montgomery County freshmen this year in the 100-meter hurdles (16.78) and the 300-meter hurdles (47.75). She came a long way since her first race indoors when she ran 10.91 in the 55-meter hurdles. She PR'd by over two seconds in the 300-meter hurdles at the regional championship to qualify for states. According to coach Mark Brown, if she had things her way the girls would run with the hurdles at the boys' height. Tiara Wellman, Northwest - Coach Beth Muehl says that Tiara Wellman could at times be a perfectionist, critiquing her performances even if she won a race. Wellman was by far the top county freshman 400-meter runner this year with a fifth place finish in 58.20 at the 4A state championship. She helped Northwest break county and state meet records on the 4x400 relay. Freshmen of the year should of been split between the three northwest girls who all contributed to northwest s dominant season. If anything wellmen should received it due to tremendous improvement and countless 4x4 records from Penn to md state championships northwest dropped 15+ seconds on the 4x4 and more credit is due. CONGRATS TITANS Alexia Mitchell, Tiara Wellman, Zionna Scott, Kendra Meredith, Naomi, Sheppard. Congrats Bethany on a job well done! lovin my girls Kendra, Tiara, and Naomi. Cant believe you all made it and continue to reach your goals in running!! GO JAGS!